The Walther Model 9 was first manufactured in 1921, a year after production of the very successful Model 8 had begun. 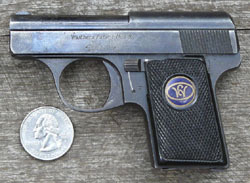 The company was still making its .25 caliber Model 5 and in fact continued to market it until 1923, but Walther wanted to produce the smallest .25 caliber vestpocket pistol in the world, and they wanted it to be stylistically similar to the Model 8. They also wanted it to uphold the company’s reputation for quality workmanship, accuracy, and reliability. The Model 9 turned out to be successful in most of these ways, and proved very influential, spawning a dozen or more imitations and forcing FN to design its Baby Browning in order to stay competitive. 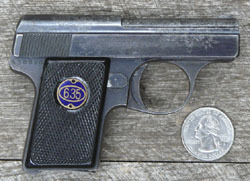 While the Model 9 retained the straight, clean lines of the Model 8 and used identical grip medallions, it was quite a different gun internally. In order to reduce size, the first thing that had to go was the internal hammer which had been standard on the Models 2 through 8. In the long term, hammers are more reliable, but size trumped reliability in this instance. 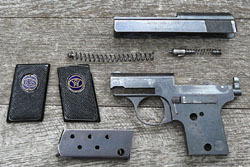 Walther returned to the spring-loaded striker that had been used on their Model 1. 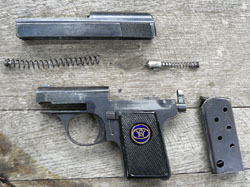 The small striker spring that was employed has proven to be the weakest feature of the gun--when compressed for long periods of time it loses its power and will often fail to ignite primers. Other features of the Model 1 that were adopted in the Model 9 are its open- top slide, top-mounted extractor, and recoil spring situated beneath the barrel, but the Model 9 is a simpler design with fewer parts. The slide is a breech block assembly with two arms that extend forward on either side and meet just beneath the barrel to form a cross piece that serves to compress the recoil spring. The extractor is a piece of spring steel, with a hook on the end, in a space drilled in the slide just above the striker. The recoil spring is contained in its recess in such a way that it does not require a guide. The connector, which runs externally on the right side of the frame, has an integral spring. The ejector is a very low-profile projection on the left side of the frome, just behind the magazine well. The slide is held on the gun by a clever dumbell-shaped bolt at the rear of the frame, the upper portion of which serves as a backstop for the striker spring. The bolt has a hole drilled in its upper portion through which the rearmost projection of the firing pin protrudes to indicate when the gun is cocked. The safety blocks the striker. Unfortunately, down is the safe position, and up is the fire position, the reverse of most other vest pocket pistols. The left grip is thinned at the top where the safety rides. This is the weakest part of the grip, which is often found broken, as on the gun displayed here. The Model 9 continued in production until the end of World War II in 1945. Three types were produced, with a total production estimated at near 250,000. 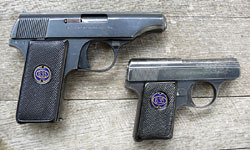 The Type I had blue enamel grip medallions, one with the CW monogram in an oval and the other with “6,35” in an oval, just like the Model 8. The right side medallion was held by a small screw which was installed from the rear through a hole in the right grip portion of the frame, while the left side medallion was screwed into a nut using a special tool or a pin spanner. The grip panels are somewhat difficult to remove and reinstall, but not nearly as bad as the Model 8. There was no magazine safety. 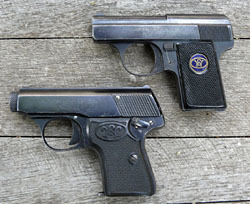 Type II Model 9’s were simplified somewhat. 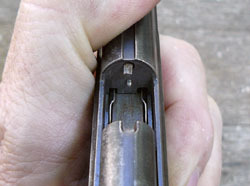 The little metal point at the front of the recoil spring was eliminated and a post was installed in the front of the slide for the spring to fit onto. The grip medallions were eliminated and replaced with a simple washer and screw. This wasn’t nearly as nice looking as the medallions, but was more practical and probably a lot cheaper. Type III Model 9’s have a magazine safety added on the right side of the gun. 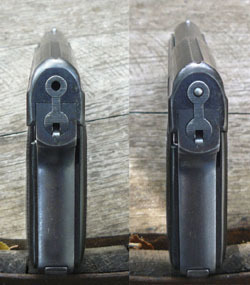 A small lever is lowered when the magazine is removed, locking the transfer bar. I have owned two different Model 9s. The first one I had to return to the gun store where I bought it because neither I nor the store’s gunsmith could make it feed and eject properly. When I first bought it the striker spring was too weak to set off primers consistently. I bought a spring set from Wolff springs, but the striker spring was slightly too long to work in my gun, so I had to cut a coil off it. While I was at it I replaced the recoil spring and the magazine spring, but I was unable to get the gun to work. The gunsmith even went so far as to order another magazine for it, but that didn’t help either. Fortunately, the next Model 9 I bought (the one shown here) was much better. It has functioned flawlessly since the first day I took it to the range. I have never had a gun as small that was as accurate as the Walther Model 9. 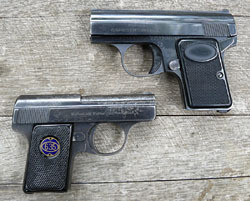 The Baby Browning, which appeared in 1932, is only very slightly larger than the Model 9. The Walther feels a bit too small in my hand, whereas the Baby Browning feels just right. But the Walther is more accurate. The Walther Model 5 is only slightly larger than the Model 9 and feels very natural in the hand. The Model 5 is extremely well made and has a more reliable internal hammer instead of a striker. Make sure the chamber is empty, then pull the trigger to uncock it. Press in slightly on the dumbell-shaped bolt at the rear of the gun, and use the toe of the magazine, your fingernail, or a small instrument to lift the latch up. The bolt should slide back under spring tension, but you might have to pull it back manually.